A fat burning and cellulite treatment method that achieves better results than going to the gym? Sounds too good to be true, doesn’t it? I’m always dubious of ‘get-thin quick’ schemes. I love my food and don’t believe in faddy diets. 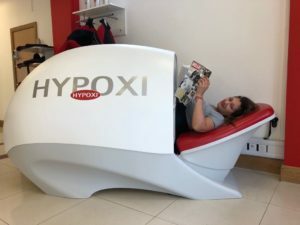 However, when a friend introduced me to HYPOXI® I was curious and wanted to find out more. I’m now a complete convert, having witnessed amazing results firsthand. Rather than being secretive about it, amongst whispers of “How did she do it?”, I think everybody should know about this fantastic treatment! 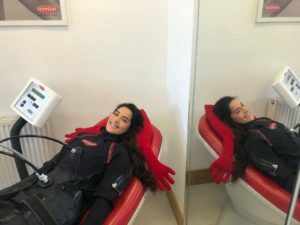 HYPOXI® is popular with a whole host of celebrities, having started out in the spa in Harrods, and now this star treatment is available to everyone. I’m an active 42 year old mum of 2 and no matter how much exercise I do, or how many sit ups I try, I always have my “mum-tum”. I eat relatively healthily, I run 3 times per week and play tennis, so I work hard at trying to stay in shape. However, as you get older I think it’s easy for the pounds to creep on and for your waistline to gradually expand. Everybody knows we all have areas on our body which are harder to target than others. With HYPOXI®, I was completely amazed at the transformation in my body shape in just 3 weeks!! The only thing I changed in my diet / lifestyle was to follow the golden rule of not eating carbs after the treatments and avoid eating late at night (even then I enjoyed the occasional dinner out with friends and family). I still ate plenty of carbs, as you can have carbs up to 2 hours before your treatment and on non-HYPOXI® days. 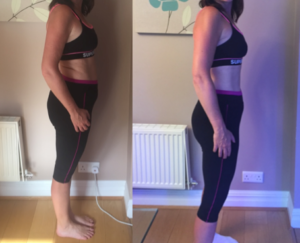 I had the recommended 3 sessions per week for 3 weeks and I lost an incredible 15cm around my hips and 9cm around my waist! I just couldn’t believe the results. I also lost 5lbs in weight, but HYPOXI® is more about body shaping than weight loss. I started to notice a real difference after just 3 treatments. More importantly, I could fit into clothes I hadn’t worn for years and I actually had a waist to be proud of! So what to expect? The studio is based in Sunninghill and you are made to feel welcome and at ease immediately. Everybody is welcome no matter what size or age (I’ve been in the studio with super-toned girls and a lady in her late 70’s)! You spend 20 minutes in the Dermology suit which gently massages you whilst you relax with a hot or cold eye mask. You literally lie down and let this state-of-the art suit work on the elasticity of the skin and any cellulite. It firms and tones along with lymphatic drainage which rids of toxins and water retention. Gentle pressure is applied via in-built suit ‘bubbles’ applying alternate pressures (vacuum vs compression) similar to the ancient technique of cupping. You will notice little circles on your skin after this treatment, which disappear quickly. It is the most natural, relaxing and enjoyable experience. Following the massage, there is a 30 minute fat burning treatment. You can either opt for the Vacunaut, as I did, which targets the stomach and the hips, or the ‘egg pod’ bike which works on the whole silhouette (tummy, hips, bum and thighs). You wear a suit and gently walk or cycle for 30 minutes (and when I say gently – I mean gently as you are kept at the optimum fat burning level whilst drinking fresh mint and lemon tea!). That’s it! Within one hour you are done and all you need to do is make your next appointment! All the guidance and information on nutrition is provided to you and is easy to follow. Wear cheap leggings and a vest top (expensive lycra can be too tight and prevents good connection to the skin). Bring your trainers and SOCKS. Eat your evening meal before 7-7.30pm and avoid snacking after that time. Don’t eat 2 hours before or after your treatment. Avoid caffeine after your treatments. Don’t arrive early as the studio is always busy. So if you are even slightly tempted or intrigued, book a trial with HYPOXI® Ascot. I promise you’ll be delighted that you did! I can’t wait to go back! You can find out more here too.